Hand sewn from natures materials, these exotic and stylish decorative throw pillows bring added comfort, luxury and excitement to your home decor. Flokati wool shag makes wonderful pillows and are suitable in any room as well as comfy bed pillows.. Flokati pillows are especially beautiful in the bedroom, and are available in sizes up to 28” x 28”. Leather cowhide pillows are an extravagant touch of the exotic in the living room, on the couch and essential to a western or southwestern decor. 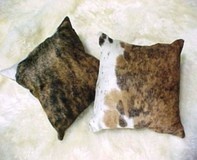 Natural and animal print cowhide pillows are a perfect complement to your animal print cowhide rug and safari décor. We can custom order your throw pillows in the same materials as many of our exotic area rugs; all natural patterns and colors of natural cowhides, as well as a large selection of animal prints. 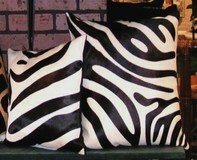 Available in natural and designer colors, sizes 18" x 18" and 28" x 28"
Available in all natural patterns and colors in size 15" x 15"
Available in large selection of exotic animal prints, including zebra, tiger, leopard and more; in size 15" x 15"